In Wiltshire, Fleur-de-Lis, Renaissance Retirement’s new independent living site, has 28 one and two bedroom apartments, built on the former Old Yard in Marlborough. In an ‘arts and crafts style’ it has sweeping, sprocketed roofs, Voysey dormers and large chimneys. 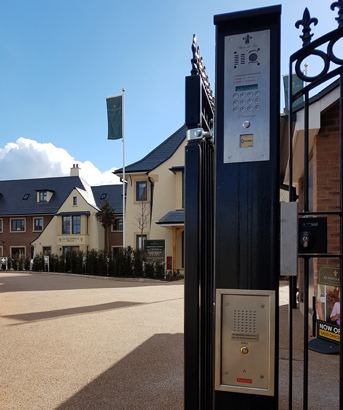 Orestone Controls Limited were the preferred and specialist installer for the retirement living development company. The specification for the development including Comelit’s bespoke door entry panels had to present an independent lifestyle in a contemporary setting, and in a modern style. Paul Williams, Construction Director for Renaissance, says: “Fleur de Lis stands as one of our major new home launches. Not only does it look aspirational from the outside, but each apartment presents a real opportunity for those seeking to maintain a quality standard of independent living and uphold a luxury style of life. Orestone Controls worked with Renaissance from the initial design and specification of security and fire systems on site, to installation. For door entry, Comelit’s two-wire SimpleBus product with mini handsfree monitors were selected to operate with KMS Access Control and FAAC gate control kit, installed to control the front gates and main entrance to the site. Richard Chadd, Orestone Controls’ Engineering Manager added: “We have worked with Renaissance Retirement Limited long enough to understand their requirements and high expectations to deliver luxury as standard. And Fleur-de-Lis even takes this to the next level; to provide an exceptional standard of independent living. Warden and nurse call systems, operated through a specialist PA (public address) offer residents calls to necessary services in case of emergency. Gareth Goodall, Comelit Business Development Manager added: “Renaissance Retirements’ exceptional Fleur-de-Lis development, in its provision of age-exclusive apartment living close to all the local amenities, is the ultimate choice for those desiring a peaceful and independent retirement lifestyle.